3.3.2 The Highest Acceptable Merchant Usage Fee . 3.4.2 Unitary Network with Sector Specific Usage . Figure 4.4 Evaluation of smart meter market structures. . . The phenomemon of multi-sided markets has attracted significant academic interest over the last two decades. Even though these types of businesses have existed for a long time, researchers only began to investigate their peculiarities thoroughly in the mid-1990s. The probable reason for this quite recent emergence of interest is the fact that technological developments, such as the internet, have exacerbated the importance of network effects, which are a major force behind multi-sided markets. Consequently, businesses that operate in multi- sided markets, such as Google, Facebook, or Visa, play a more essential role in today’s society. In these markets, firms employ distinct pricing strategies that observers are sometimes struggling to comprehend even today. While market participants are trying to exploit these novel opportunities, regulators and academics all over the world are discussing the economical impact of multi-sided markets. In a multi-sided market, a platform needs to serve two or more dis- tinct customer groups to function at all, and the value of that platform to at least one customer group has to depend on the actions and/or the number of participants on the other side (Evans, 2009). A classic example of a multi-sided market is the newpaper (or magazines). A simple schematic depiction of this market can be seen in Figure 1.1. Newspaper revenues are comprised of subscription payments from readers as well as advertising fees paid for space in the publications by other businesses. Readers exhibit indirect network effects toward advertisers. This means that the value of each advertisement, and thus the price that can be charged for it, increases with the number of readers of the newspaper (Evans & Schmalensee, 2008). In the other direction from advertisers to readers , however, there are probably no indirect network effects in this example. The value of a publication for the reader seldom increases with the number of advertisements in it. Figure 1.1: Interactions of a newspaper from a multi-sided market perspec- tive. on the other hand, political newspapers may limit ad space to be able to demonstrate journalistic independence and make money through subscription revenues. The first example of offering readers material service free of charge demonstrates a common outcome of multi-sided markets (Jullien, 2001); often one side of the market receives the ser- vice below its true marginal costs even if the platform operator is a monopolist (Blair & Romano, 1993). This market side exhibits indirect network effects. Its presence adds significant value to the other market side(s), which have to pay for the privilege of interacting with them. In some contexts, this practice may seem unfair. On the grounds of eliminating gender discrimination, some states in the United States (of America) (US) (e.g. California in 1985, New Jersey in 2004) have prohibited nightclubs and bars from offering ’Ladies Night’ the practice of granting women reduced prices on cover charges or drinks (Wickham, 2004; Wright, 2004a). However, the more women that are present in a club, the more attractive it becomes for heterosexual men to enter the club as well. Thus, in equilibrium men pay more because they are receiving a higher value in return. Taking this point of view into consideration, the chosen price structure can be regarded as fair and also beneficial to men. Consequently, to make an informed judgement about pricing strate- gies it is essential to ascertain whether one is dealing with a multi- sided market or not (Evans, 2009; Wright, 2004a). Suppose a monop- olistic platform operator is employing a price structure where the first market side receives the service below marginal costs while the second side has to pay a premium. If ]a regulator solely considered the second side and was ignorant about the fact that the other side exists and is relevant, it could conclude that the platform was exploiting its position as a monopolist and charging excessive fees. However, in a multi-sided market a competitive equilibrium can have a comparable price structure so that it can be quite difficult to identify exploitation strategies (Wright, 2004b). Concerning market power in multi-sided markets, regulators have raised an additional concern. In traditional markets with market power, excessive prices lead to inefficiently low consumption. In contrast, in multi-sided markets regulators may suspect that the unequal price structure induces excessive consumption of the service. This argument is made in the context of payment cards1. When consumers purchase a good or service with their payment card, they are generally not charged (or may even receive rewards, such as frequent flyer miles), while the merchant who accepts the card payment has to pay a service fee called the merchant usage fee to the card network.2 This fee is automatically deducted from the amount the merchant receives from the card network for a sale. If consumers are lured into using their payment card by too a low price and merchants are not able to reject accepting payment cards (Vickers, 2005; Bolt & Tieman, 2008) then too many card transactions may occur in equilibrium at the expense of other methods of payment, such as cash or checks (Wright, 2010b; Rochet & Tirole, 2011). To sum up, businesses in multi-sided markets have to balance their price structure with respect to at least two distinct customer groups who interact with one another. In doing so, they may attract the attention of regulators striving to determine the economical impact of their actions that can be quite different from what standard economic thinking would suggest. 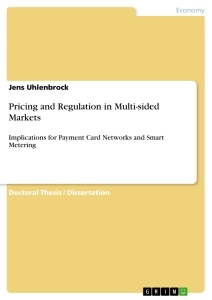 These two topics pricing and regulation of multi-sided markets are dealt with in this thesis. Before going into the details of the three articles in this thesis, however, a broader survey of the existing literature is provided. This section offers an overview of the areas of research already con- ducted on multi-sided markets. It begins in section 1.2.1 with a classi- fication of multi-sided markets. After this general introduction, there is a special focus on the payment card market as this is the best re- searched multi-sided market thus far and two articles in this thesis are concerned with payment cards.3 Section 1.2.2 offers a basic in- troduction into the payment card market followed by a discussion of the most widely used framework introduced by Rochet & Tirole (2002) in section 1.2.3. Section 1.2.4 takes on the discussion about the regulation of interchange fees and section 1.2.5 discusses the social costs of payment cards. Businesses in multi-sided markets are called platforms. They bring to- gether other businesses and/or people (two distinct customer groups) and enable interactions among them. To begin, a general categoriza- tion of the different types of multi-sided markets is in order, which is best done according to their common functions. According to Evans & Schmalensee (2007a), multi-sided platforms are either matchmakers, audience builders, or cost sharers. Table 1.1 gives examples of these three types of platforms. Matchmakers, such as eBay or NASDAQ, bring buyers and sellers together for all types of products. MySpace creates a meeting place for people with all sorts of personal interests. The common characteristic of these platforms is that they create value because they match people who need each other in one form or another and facilitate transactions between them. Additionally, the platforms can also settle disputes and create norms of behavior through a standardized set of rules designated by the platforms. They thus constitute an integral part of an economy. Audience builders like Google or the British Broadcasting Corpora- tion (BBC) offer content that appeals to potential customers of advertis- ers. Advertisers could not easily contact these potential customers on their own and thus buy their attention from these audience builders. It is a typical example where the the presence of one side (the advertiser) does not increase the value of the platform to the other side (the audi- ence). In other words, positive indirect network effects only flow in one direction, from the audience to advertisers. This business model has proved to be essential for online sites where consumers the audience have grown accustomed to receiving content and services for free. Lastly and also important are the cost sharers. The Windows or Linux platforms provide a standardized programming environment that programmers can rely on to reach a substantial number of users of their programs. This common platform frees programmers of web browsers or office suites from worrying about how the internals of processing or graphics hardware function and allows them to con- centrate on their specific products. In other words, they eliminate a duplication of effort. Table 1.1: Examples of multi-sided market types by function (adapted from Evans & Schmalensee, 2007a, p. 7). the most prominent and best researched multi-sided market.4 As a consequence, it is advisable to specifically look at the literature on this market. Lessons learned can then be transferred to the smart meter market. Payment cards facilitate the payment process and reduce costs to merchants and consumers for handling monetary transactions. A transaction with a payment card network can involve up to five differ- ent actors: The consumer, the consumer’s bank (issuer of the payment card), the card network, the merchant’s bank (acquirer of payment transactions on the merchant’s behalf), and the merchant. In a unitary network (such as Discover or American Express), there is only one institution performing the three functions of card network, issuer, and acquirer. In a multi-party-network (such as Visa or MasterCard) these are three separate institutions with hundreds of different banks acting as issuers and/or acquirers. Figure 1.2: Workings of a unitary and a multi-party payment card network (Gans & King, 2003, p. 4). fee a. Consequently, the merchant usage fee has to be at least as high as the interchange fee or a ≥ i. Both the issuer and the acquirer have to pay a membership fee to the card network and agree to adhere to the rules that the specific network sets. Among others, these rules determine the level of the interchange fee. The interchange fee especially has attracted great scrutiny ever since it became the focus of a lawsuit the bank NaBanco filed against Visa in the early 1980s (Chang & Evans, 2000; Evans & Schmalensee, 2007b). To facilitate transactions among its many member banks, Visa had set a unified interchange fee that all its issuer and acquirer banks had to adhere to when conducting transactions under the Visa brand. NaBanco argued that such a monopolistic price setting was anti- competitive, and individual banks should be allowed to negotiate terms for and among themselves. Baxter (1983), who was the first to look at payment networks in a scientific article, provided some of the arguments against NaBanco’s position. If every issuer were to negotiate its interchange fee with every acquirer, the number of necessary negotiations would simply be the product of issuers times acquirers, which would lead to pro- hibitive transaction costs. In addition, there was a significant free-rider problem. If one issuer were to unilaterally increase its fees, while others did not, the full revenue increase would accrue to this one issuer. The increased costs, on the other hand, would be spread among all acquirers who had to deal with this issuer. As a countervailing action, acquirers could refuse to do business with this issuer. That scenario would mean that consumers and merchants could not be sure that a card from a specific issuer would be accepted at the store where they wanted to use it, thus significantly increasing uncertainty and reducing the true value of the card. Consequently, Baxter (1983) argued that card networks should be allowed to set common inter- change fees and also impose an honor-all-cards rule that states that participating merchants must accept every card issued by a member of the network.5 In the end, the Eleventh Circuit ruled in favor of Visa, stressing the pro-competitive elements of a unified fee. Nevertheless, the Court’s decision did not end the discussion about interchange fees. Carlton & Frankel (1995) argue that the ruling was essential flawed. Their argument is based on the neutrality of the price structure, which means that if acquirers were unwilling to pay inter- change fees, they would be able to lower the merchant usage fee and the merchant in return could lower prices. Consumers could then pay less for the product, but they would have to pay a fee to the issuer for using the payment card. Overall, the allocation of fees would change, but total fees and revenues as well as the purchase amount would stay unaltered thus producing neutrality of the price structure. Because the equilibrium would not change, issuers and acquirers should not have to face a unified interchange fee set by a monopolistic card net- work. To make matters worse, they argued that cash payers essentially were subsidizing card users since most merchants simply charged a common price for their products independent of the payment method. However, they were cautious in advising regulatory intervention into what was obviously a successfully operating business model without further evidence on the harmfulness of that business practice. Evans & Schmalensee (1995, p. 891) provided the counter-notion, namely, that the “value of payment card services to consumers de- pends on merchant acceptance, and the value to merchants depends reciprocally on consumer usage.” This notion implies that the demand on one side of the market does not only depend directly on the price charged to that side, but also indirectly on the demand of the other side. This idea was an adaptation of the older notion of network ef- fects introduced by Katz & Shapiro (1985). Traditional network effects are direct, e.g. the value of a telephone increases with the number of people who also have one. Katz and Shapiro also recognized that consumers indirectly benefit from buying popular hardware because more variety of software is then provided, thus stressing the value to the same market side, namely, the consumer. The importance of indirect network effects for a multi-sided market, however, derives from the value that at least one side of the market provides for the other. This idea of indirect network effects plays an important role in most multi-sided market models. Platforms set prices in such a way as to get both sides on board rather than having a “fair” cost allocation, a practice that is widely approved of in the literature (Chakravorti, 2010). Apart from the fact that it is sometimes difficult to allocate costs to one side of the platform when having large fixed costs and low transaction-specific variable costs, costs are only one side of the coin. The other and more important side is the value the platform adds, which should be the main determinant of any efficient price structure. This insight that optimal prices may not reflect marginal costs is not limited to multi-sided market economics. In effect, it was recognized as early as with Baumol & Bradford (1970) who suggested that providing public utilities to each consumer at respective marginal costs might not be socially optimal. Faulhaber (1975) argued that pricing based on marginal costs does no more than ensure ”that the production and sale of each commodity makes all consumers at least as well off as they would otherwise be.” Instead, by taking into account price elasticities of demand as well as cross-elasticities, one can make consumers better off. Multi-sided market economics thus inherited its focus on efficient price structures from the theory of multi-product pricing. These two influences taken together the theory of network effects and the theory of multi-product pricing provided the groundwork for models on multi-sided markets (Rochet & Tirole, 2006b). Its break- through modeling framework and the immediate offspring it produced is discussed in the next section. Many models that aim at comparing optimal interchange fee levels or try to understand the effects of different competitive setups are built on the model first introduced by Rochet & Tirole (2002). In this model, consumers and merchants obtain a convenience benefit from using a payment card, where benefits are derived from a distribution function. Merchants engage in Hotelling competition. Issuers demand a carduser fee (that can be negative so as to model rewards) from consumers, so that only those consumers use cards, for whom the individual benefit exceeds the fee. Acquirers are competitive and simply pass through the interchange fee as a merchant usage fee to merchants. They then set the interchange fee, using different objective functions to find equilibrium values for prices and fees. The first outcome is that credit card usage increases in the interchange fee to the point where merchants no longer accept cards.6 Secondly, the interchange fee that maximizes issuers’ profits is either socially optimal or above that level. Thirdly, merchants try to steal consumers from their competitors and thus internalize the cardholders’ benefits. Rochet & Tirole (2003) significantly altered this framework to show different competitive setups of two-sided platforms. They modeled a private monopoly, a Ramsey planner, as well as competition between for-profit and non-profit platforms. Most interestingly, they found that the price structure in all cases is skewed against one side (e.g. merchants) so as to get both sides on board. The main difference between a Ramsey planner and a private monopoly is that the former takes into account all positive externalities between the market sides. Further, for competition between platforms, the aspects of single- and multi-homing become relevant. A user single-homes, if she is only using one platform (e.g. only holds a Visa card), while she multi- homes, if she is using more than one platform (holds both a Visa and a MasterCard) and then can ultimately choose separately which platform to use for each transaction. A further result of the model is that the more users on one market side multi-home, the easier it is for the other side to ignore one platform and steer transactions towards the competing platform. The other market side then has to pay a lower platform price, since it is ultimately deciding, which platform will be used. Wright (2004b) extended the original Rochet-Tirole framework by allowing for heterogeneous consumers and merchants, imperfectly competitive acquirers, and transaction-specific cardholder fees. With these alterations, the privately set interchange fee can be higher or lower than the socially optimal fee. The reason is that there are two (potentially countervailing) deviations from the social optimum. First, the network’s profits can be transferred to the side of the platform where competition is least by increasing interchange fees, if these fees are directly passed on to merchants through higher merchant usage fees, but only transferred to consumers to a lesser degree. Second, there may be an asymmetry in the inframarginal effects. The marginal user does not take into account her value to all existing users on the other side of the platform. Armstrong (2006) is concerned with different competitive environ- ments between platforms in general. Therefore, he deviates from the Rochet & Tirole (2003) framework, employing certain technical varia- tions regarding agents’ utilities, platform fees, and costs. He finds that competition among platforms may skew prices even more towards one market side than if there were a monopoly platform, because exhibit- ing positive externalities is rewarded more extensively. If a monopoly platform loses such a beneficial user, the positive externality is lost altogether. In contrast, a duopolist platform may lose this user to the competition, where this user’s positive externality may additionally lure other users away from the first platform. He further considers a case of competitive bottlenecks, where at one market side there is a group of single-homers as well as a group of multi-homers. Plat- forms then increase prices to the multi-homers and use this revenue to compete for the patronage of single-homers. These are important insights to be taken from this strand of litera- ture. However, there is also one limitation, namely, that if merchants are heterogeneous, this aspect derives from unobserved variations. These unobserved variations are simply modeled through a random variable that represents a merchant’s convenience benefit drawn from some distribution function. However, these models do not explain just how these differences emerge in the first place. The models in chapters 2 and 3, on the other hand, do model both a Bertrand and Cournot environment, respectively, where specific market characteristics can account for some of this variation. A very intense discussion over the last few years has focused on the question of whether payment card fee levels should be regulated at all. For instance, in the US, debit card merchant usage fees are now restricted, leading some banks to start charging consumers for debit card transactions (Bernard & Protess, 2011). The motivation behind this legislation is to limit the exploitation of market power. As Schmalensee (2002) has noted, the premise is different than for most such cases, since companies with market power usually restrict output to increase prices and profits. An exploitative payment card network, on the other hand, would be able to increase prices (interchange fees), and profits as well as increase output by offering higher rewards to consumers and thus lure them into using their cards more often. Several recent articles have investigated the rationale for regulating interchange fees on this basis. Wang (2010) models a mature card market with a fixed set of card- holders where the intensive margin of making existing consumers pay by card is most relevant. The multi-party card network, which acts like a unitary network because of competitive price taking acquirers and issuers, exerts vertical control over merchants. In his model, the card network increases the interchange fee when the technological costs of providing card services diminish. Reward payments as well as the transaction value also increase, but consumer welfare may not since products become more expensive, so that the card network is then able to extract the complete benefits of technological advances and economies of scale. The result is that the socially optimal interchange fee is lower than or equal to the monopoly interchange fee, but also higher than the minimum fee. Wright (2010b) also shows that merchants are paying too much and consumers paying too little for payment services. His analysis mostly rests on the idea of strategic competition or merchant internalization. Merchants try to steal consumers from other merchants and internalize the consumer convenience benefit of using a payment card. They thus accept cards even if their own benefits are less than the merchant usage fee they have to pay because they hope to win the patronage of these consumers. Chakravorti & To (2007) use similar logic with the credit facility of credit cards in a two-stage game. In the first stage, merchants steal business from other merchants. However, because all merchants engage in the same game, they all end up in a prisoner’s dilemma situation where no merchant gains any business on balance. Rochet & Wright (2010) provide a rationale for regulating inter- change fees based solely on the notion of consumer surplus. They specifically model the credit functionality of credit cards that can re- place in-store credit supplied by some merchants and thus add value. Consumers can either use cash or credit card for ordinary purchases, and if nature allows, the credit card or the in-store credit for a second credit purchase. In their setup, the monopolistic payment network will set the interchange fee as high as the merchants can bear, so that the privately set interchange fee is always excessive and needs to be regulated to maximize consumer surplus. The degree of the reduc- tion, however, depends on a tradeoff. For ordinary purchases, credit cards are more expensive than cash. These convenience consumers inflate costs and reduce welfare when using their credit cards exces- sively. For credit purchases, however, credit cards are less costly than in-store credit, creating the opposite effect when consumers switch to credit cards. If the first effect dominates (e.g. for medium-sized merchants) the necessary fee reduction would have to be larger than in a case where the second effect dominates (e.g. for small merchants). The latter always appropriate reduction would be a cap on the merchant’s net avoided costs of not having to provide in-store credit. The level of fee reduction proposed here is the same as in Rochet & Tirole (2011) and called the “tourist test threshold”. Card fees should be low enough, so that a merchant does not want to refuse a card payment to a one-time customer holding sufficient cash. This argument is again based on the maximization of short-term consumer surplus. A key assumption is that merchants accept card payments if the merchant usage fee does not exceed the sum of the merchant and consumer benefits from card usage. In other words, merchants internalize the value that cards add to consumers because that practice makes the store more attractive to cardholders. Once the consumer has decided to buy, the merchant may have an incentive to steer the consumer toward cash payments, if the fees increase his operating costs. In this case, the fees fail the tourist test. In their benchmark model with constant issuer margins and homogeneous merchants the tourist test maximizes total user surplus, but the interchange fees are too low from a social welfare perspective, since the latter includes issuers’ profits, which increase in interchange fees. Overall, these models argue that there is some basis for interchange fee regulation. The reasons are distinct, but based on a special position of the card network. It is either able to extract all gains from techno- logical advances and economies of scale, whereas a more balanced allocation could increase social welfare, or consumers are courted at the expense of merchants by the card network itself or by merchants who engage in strategic competition. However, all these models are based on private prices of payment instruments observed in the mar- ket rather than real social costs. This so far missing perspective is provided by the articles discussed in the following section. To discuss a social optimum, it is necessary to ask whether the private prices of payment instruments reflect true social costs. After all, no market participant is paying a direct fee for using cash, while it is obvious that providing coins and paper money does involve true social costs. According to Humphrey (2010) a country’s payment system costs around 1% of Gross Domestic Product (GDP) annually; these are costs that are borne by the taxpayer in case of paper money. This fact is commonly disregarded in the literature, where the merchant usage fee and other card transaction costs are routinely compared to the private costs of handling cash. Social welfare comparisons are then conducted using these uneven terms. One of the first studies to try to compare the costs of payment instruments comprehensively was conducted by Humphrey & Berger (1990). They found that overall, cash is the cheapest instrument, based on private as well as on social costs. However, apart from technological advances, one will notice that there are potentially large economies of scale in electronic payment processing. These have first been noted in other contexts. For instance, Hancock et al. (1999), based on an empiri- cal investigation, argue that economies of scale are mainly responsible for price reductions in the Federal Reserve’s Fedwire electronic funds transfer operation from 1979 to 1996. Furthermore, economies of scale are expected when integrating regional services and operations. Ac- cordingly, reducing (transnational) payment costs is the main goal of a unified Single Euro Payments Area (SEPA). In this context, Bolt & Humphrey (2009) used the private payment data of six Dutch banks (ABN-AMRO Bank NV, ING Group, Coöperatieve Centrale Raiffeisen- Boerenleenbank B.A. (Rabobank), Fortis N.V., Samenwerkende Ned- erlandse Spaarbanken (SNS), and Friesland Bank) for 1997-2005 to develop an estimation of scale economies. Their model suggests that doubling the payment volume could lead to reductions in average transaction costs of approximately 35%, however, while ignoring addi- tional telecommunication expenses. For a cross-country panel of Euro countries, Bolt & Humphrey (2007) using data on scale economies from Norway, the Netherlands and Belgium and deriving predictions for the other countries through an estimated cost function found the scale economies of debit card transactions to be around 0.11 for the Euro zone. Similarly, Carbó-Valverde et al. (2008) prepared an estimate for Spanish banks that doubling the volume of card processing would reduce costs by about one-third. It has thus been argued that a switch from paper-based to elec- tronic payments could lead to economies of scale and reduce overall transaction costs. Humphrey et al. (2001), based on semiannual panel survey data, estimated that a complete switch from a paper-based system to an electronic system using debit cards and electronic giro payments could save up to 0.6% of GDP7 in the Norwegian case. They assume that electronic payments cost only one-third to half as much as paper-based transactions and specified a model of payment choice based on direct price incentives at the point of sale. The Norwegian case is particularly interesting, as Norway has actively used cost-based price incentives to steer consumers towards use of electronic payment methods. Garcia-Swartz et al. (2006) obtained a similar finding. They conducted a marginal cost-benefit welfare analysis of payment choice to find that electronic transaction are significantly less costly for most transactions, while for small transactions, the differences are minimal. However, because payments cards charge merchants to a larger ex- tent than prior payment methods do, merchants may end up paying a larger share of the burden. Lastly, Guibourg & Segendorf (2004) found for the Swedish case that private prices to consumers poorly reflect social costs and cash is substantially cross-subsidized even though electronic payments are less costly. They recommend steering consumers towards electronic payments. Overall, payment cards have lower social costs than paper-based transactions do. However, when looking at private prices, studies have diagnosed excessive card usage and identified that merchants do shoulder a disproportionate share of the costs since card networks engage in price discrimination. They excise as high a fee as the par- ticular merchants can withstand. As with usual price discrimination, prices are maximized. However, there is an additional aspect to this debate. Card companies have imposed a so called no-surcharge rule.8 It forbids merchants from surcharging based on the chosen payment method. In a world without transaction costs (where surcharging is costless), merchants could easily discriminate against more costly pay- ment methods. Private prices would then be aligned with costs, so that usage would become efficient from the point of view of the merchant. The interchange fee then becomes neutral because all costs can simply be passed on to the consumer (Carlton & Frankel, 1995). Some models thus predict that allowing surcharges would indeed improve overall welfare (Wright, 2003). However, when merchants are not allowed to surcharge, they are not able to pass through the higher (private) costs of payment cards to cardholders. They employ an average price where cash consumers pay too much and cardholders pay too little. Cash consumers end up subsidizing cardholders. At least, this outcome is what conven- tional wisdom suggests and why regulators in some countries have forbidden no-surcharge rules.9 Taking into consideration that the so- cial costs of payment cards are lower than those for cash, cardholders are subsidizing cash users through taxes. Bolt et al. (2010) have con- sequently argued that eliminating surcharges could efficiently lead to more card transactions. They observe that one in five merchants in the Netherlands surcharged in 2006 mostly small merchants and for small transactions below €10. This policy effectively deterred card usage, which would from a societal perspective be desirable. Imposing a no-surcharge rule could help, albeit at the expense of reducing the merchants’ bargaining power, a circumstance that would have to be further observed. In this context then, this thesis strives to offer new insights in two main areas. First, in the well-researched domain of payment cards chapters 2 and 3 investigate an aspect that has hitherto been scantly examined, namely, the fact that merchant usage fees differ substantially among merchant sectors. Additionally, if payment card networks are able to patronize certain sectors, which ones are they likely to pick? Second, chapter 4 identifies the smart (electricity) meter market as a multi- sided market and applies the insights found in the literature to better regulate a market-driven rollout of smart meters, the current objective in several countries and states, such as Germany. Chapter 2 examines the determination of the merchant usage fee of a monopolistic unitary payment card network based on the character- istics of the downstream market. Merchants engage in Bertrand price competition that allows for an observation of heterogeneous prod- ucts. My coauthor and I find that the payment card network extracts a part of the economic rent that merchants obtain. The higher this rent, the higher the corresponding merchant usage fee. The rent, and consequently the merchant usage fee, is increasing in the downstream market size, but decreasing in the price elasticity of consumer demand, as well as in the substitutability of products, and interestingly, in the fraction of consumers who prefer card payments. The intuition for this last result is that merchants increase prices if more consumers use card payments and overall sales thus go down. In reducing the merchant usage fee, the payment card network then tries to mitigate this effect. Chapter 3 undertakes a similar analysis for Cournot quantity com- petition among merchants. The merchant usage fee is decreasing in terms of the price elasticity of demand and has an inverse V rela- tionship with regard to the fraction of card users. At first, increasing the fraction of cardholders makes accepting cards more attractive for merchants because of the increased revenue they can obtain from actual sales. At some point, however, the higher costs of handling card transactions outweighs the benefit of increased revenue, and the optimal fee then decreases. Contrary to prior research, the number of merchants in a given sector is not found to influence the level of the merchant fee. Further, card companies can increase profits by influenc- ing consumers to use their cards in sectors with a low price elasticity of demand where they can then tax a merchant’s profits more heavily, which leads to a double marginalization. Chapter 4 looks at smart (electricity) meters, regarded as a crucial element to increase energy efficiency by balancing energy supply and demand better. Nevertheless, most countries thus far have not seen a comprehensive smart meter rollout. A key economic obstacle to a market-driven rollout is the fragmentation of the benefits among multiple stakeholders, which disperses investment incentives. My coauthor and I investigate how best to overcome this investment barrier by analyzing three distinct smart meter market structures. A key parameter for the analysis is the recognition that the smart meter market is multi-sided, making it essential to consider its peculiar characteristics. Our qualitative analysis indicates that a combined smart meter and grid operator, with a regulatory setup that permits the socialization of smart meter investment costs among all electricity consumers, is the best suited approach to implement a market-driven smart meter rollout. This chapter is joint work with Markus Langlet. Over the past few decades the increasing use of payment cards has spawned the interest of researchers and governmental regulatory agencies.1 Payment cards are an example of a two-sided market—a market that needs to attract two different groups of customers in order to function properly. As two-sided markets exhibit peculiar features contradicting standard microeconomic theory, they are an interesting research topic. With regard to payment cards, the two distinct customers are mer- chants accepting card payments and consumers wishing to pay by card. Any card network can only operate if it attracts a sufficient amount of both customer groups. As a result, the two-sidedness of the market requires unique pricing strategies. Payment card networks do not only have to consider the price level (how much to charge in total) but also the price structure (the split of charges between the two market sides). It is a frequent feature of two-sided markets that one side is attracted by very low prices, while the other side is charged substantially.2 In the case of payment cards, cardholders typically do not pay anything for card usage while merchants pay a per-transaction charge called the merchant usage fee. However, as the European Commission Competition DG (2006) has observed, as can be seen in Figure 2.1, there are vast differences in the merchant usage fees across merchant sectors. Figure 2.1: Weighted average merchant usage fee per type of merchant sector across EU, 2004 (European Commission Competition DG, 2006, p. 41, Graph 18). organizations and schools to up to 2.4% for florists and sellers of greeting cards. Obviously, there is substantial variation. The lower bound might be a good indicator for the marginal costs of supplying the service and might only be offered on a pro-bono basis. However, it is not yet clearly understood why the variation between other sectors occurs. As an example, if it was simply a matter of the merchant size, why would airlines and car rental companies pay rather high fees? In this paper we attempt to understand the reasons for these sectoral differences. We strive to enlighten the pricing decision of payment card networks dependent on the characteristics of a downstream market (the market the merchants face) where merchants have some market power. Our study can be seen as an extension of Langlet (2009) who investigates the merchant fee determination of a unitary payment card network with merchants under Cournot quantity competition. In con- trast, we consider a unitary network and merchants under Bertrand price competition. Langlet finds that certain downstream market char- acteristics determine the merchant usage fee for the case of Cournot quantity competition among merchants selling a homogeneous prod- uct, e.g. the price elasticity of demand, the relative frequency of card usage and the competitive position of the merchants (i.e. monopoly power). We first illustrate a broader generality of Langlet’s primary results to other competitive environments for the case of the price elasticity and the propensity of users to pay by card and gain useful new insights regarding the market size and product substitutability. There are two factors that prevent Bertrand markets from yielding the strong theoretical result of competitive prices. The first are environ- ments where firms face capacity constraints, following the contribution of Kreps & Scheinkman (1983). The second factor is a strategy of firms to engage in product differentiation along the lines of Singh & Vives (1984) given that homogeneous products are generally associated with less price dispersion (Chiou & Pate, 2010). We follow this second approach. Thus, the assumption of Bertrand price competition enables the analysis of heterogeneous products, which allows for an analy- sis of product substitutability as a downstream market determinant of the merchant usage fee. The intuition of product substitutability can be projected on a continuum which ranges from the products of different merchants being perfect substitutes on the one end of the continuum to the products being perfect complements on the other end. It hence seems essential to test price competition when talking about merchants in a range of sectors. However, we are aware that it is, in the end, an empirical question whether the Cournot or the Bertrand model are better suited for specific sectors. Payment card networks usually involve interactions of up to five players: a consumer, the consumer’s bank (or the issuer), a merchant, the merchant’s bank (or the acquirer), and the payment network providing the framework, which enables the transfer of payments among the agents (i.e., infrastructure, processes, transfer standards). A significant part of the literature investigates payment card net- work pricing decisions. These are particularly interesting, because of the two-sidedness of the market at hand. Evans (2002) and Evans (2003) provide a detailed description of why two-sided markets lead to unexpected results. Firstly, two-sided markets exhibit positive network effects, meaning that the product or service becomes more valuable as more customers are using it. This makes the purchasing decisions of consumers interdependent. Consumers only want to use Visa if merchants accept it and vice versa. Secondly, the market platform has to sell two distinct products to each end of the market. In nor- mal markets some firms may also sell multiple products, e.g. due to economies of scope. In contrast, companies in two-sided markets must sell both products if they want to remain in business at all. In business environments, this problem is often referred to as getting both sides on board. Rochet & Tirole (2003) recognized that, because of these two features, firms have to choose a pricing structure, as well as a price level, in order to maximize profits. In other words, it is not enough to determine how much to charge in total, but which of the customer groups has to pay how much. Because each product benefits both customer groups, it does not make sense to apply standard microeconomic conditions, such as equalizing the marginal revenue to the marginal costs on each side. If lawmakers forced companies to price according to costs, they would firstly neglect the positive externalities each customer group exhibits on the other, and secondly, inflict upon them the problem that an allocation of costs to one side is often hardly possible; e.g. : Are costs for the payment infrastructure to execute a payment due to the consumer or the merchant? This leads to the conclusion that a regulation on the basis of costs does not work effectively in two-sided markets. One part of the price structure decision is whether to charge fixed fees or to charge fees on a per-transaction basis. As Armstrong (2006) notes, platforms may internalize some of the positive cross-externalities by demanding per-transaction fees. In this way, customers from one group have to pay every time a member from the other group actually exhibits a positive externality. In doing so, a fraction of the interaction benefit is accounted for and market inefficiencies are attentuated to. For payment card networks, this means letting merchants pay every time they benefit from the positive externality they receive from each consumer paying with the card. In the payment card industry, many merchants accepting one card typically also accept at least one other. This is facilitated by the fact that e.g. Visa and MasterCard utilize the same technology, and thus, mer- chants only incur setup costs once when connecting to the network(s).4 On the other hand, a significant number of consumers single-home and, even if they do have more than one payment card, they make the final decision on which card to use. This explains the actual pattern in the price structure that can be observed in the market for payment cards, even though transaction costs seem to be lower on the acquirer side than on the issuer side. There is quite some competition for the patronage of consumers, and rather than having to pay for the service, consumers regularly receive benefits in the form of extended credit or frequent flyer miles. This also has to do with the fact, that we typically are confronted with a buyers’ market. With this price structure of consumers receiving benefits rather than being charged a fee and with the consumer being the critical platform side, issuing appears far more profitable than acquiring.5 Merchants do not pay large fixed fees, but face significant merchant usage fees, which are a fraction of the value of each card transaction. In the remaining, the merchant usage fee is indicated by a. One can conclude that in the payment card industry, it is quite well understood why merchants pay substantial per-transaction fees while consumers are enticed to use the cards and to a far lesser degree how fees may be set under different objectives. Accordingly, this study takes the explained and prevailing price structure as given and does not seek to explain it anew. We are thus not concerned with cross- group externalities that are a principle driver for the observed price structure. For the heterogeneity in fee levels among merchants, these externalities may not play such a crucial role. For simplicitly, we are also not concerned with potential price discrimation of card issuers with regard to different consumer types (Amess et al., 2010). The model of the payment card industry presented here is also re- lated to the literature on vertical relations. We are investigating how an upstream monopoly is influenced by characteristics of a downstream duopoly. One question of interest in this literature has been to investi- gate the effects of a change in the downstream market (e.g. through a merger) on the upstream market (see e.g. Lommerud et al., 2005). One obvious difference is that in the payment card market merchants are not obliged to accept the input but can opt out of accepting the payment method leading to a price restriction. In the next section, we take a closer look at the downstream market the merchant sector. 1 Payment cards is a generic term referring to debit cards (where the payment is directly deducted from a checking account), credit cards (where credit is provided by the card network and the actual payment is made at a later point in time) as well as charge cards (where payments can only be made up to the level that the card has been preloaded with by the holder). For the purpose of this thesis, the difference is mostly immaterial and the generic term is used. 2 Other terms for merchant usage fee include merchant discount or merchant service charge. 3 A more general overview of multi-sided markets is provided by Caillaud & Jullien (2003); Rochet & Tirole (2006b); Roson (2005). 4 Excellent overviews of the literature are given by Chakravorti (2003); Rochet & Tirole (2006b); Bolt & Chakravorti (2008b); Kahn & Roberds (2009). Evans & Schmalensee (2005a) provide a comprehensive discussion of the whole industry. 5 However, in reviewing the history of non-cash payment systems, Baxter (1983) stressed that regulatory authorities had drawn a different conclusion in the case of check payments, essentially pushing for a zero interchange fee through the clearance system of the Federal Reserve. 6 A related point is made by Schmalensee (2002). If interchange fees are set collectively, output is maximized rather than reduced. 7 Note that this result is based on Overall costs of the payment system of up to 3% of GDI1 annually. Ten years later, because two to three times less expensive electronic transactions are more widely used, the payment system in most countries costs around 1% of GDI1 annually (Humphrey, 2010). 8 A variant of the no-surcharge rule are cash discounts, which are sometimes allowed even if surcharging is not. A very detailed discussion of no-surcharge rules using private prices is given in Schwarte & Vincent (2006). 9 The US Congress outlawed cash discounts in 1974, while prohibiting surcharges. Individual states may now have different regulations (for a detailed history see Chakravorti & Shah, 2001). According to Bolt et al. (2010, p. 1738), the Federal Reserve Bank of Australia has forbidden no-surcharge rules in 2003 and the European Payment Services Directive explicitly allows surcharging. 1 According to Evans & Schmalensee (2005b, p. 3), the ratio of card sales volume to total cash sales volume in the US has grown from about 3% in 1986 to 25% in 2000. Bolt & Chakravorti (2008b, p. 15), regarding the percentage of payment cards used for in-store purchases in the US, refer to an increase from 43% in 1999 to 56% in 2005 (original source: American Bankers Association and Dove Consulting (2005)). More than 50 anti-trust cases have been filed since 2005 by merchants contesting interchange fees Bradford & Hayashi (2008, p. 1). 2 Cf Caillaud & Jullien (2003) for further details on a strategy reffered to as ”divide and conquer”. 3 An extensive introduction into the payment card industry is given in Evans & Schmalensee (2005b). 4 Often, a network offers credit as well as debit cards (the latter immediately charge a consumer’s checking account and hence do not offer short-term credit in contrast to the former). With the so called honor-all-cards rule, some networks oblige merchants to accept the debit as well as the credit cards of the network; even so, the fees typically are different between the two of them. Rochet & Tirole (2008) found that the honor-all-cards rule has a socially balancing effect. 5 For details, refer to European Commission Competition DG (2006, pp. 62-77).